Pine Pollen - 1500 mg, 90 vegetarian capsules (Bio Nutrition) - Penn Herb Co. Ltd.
Pine Pollen has been used for centuries in Chinese medicine for its vitality and libido effect, natural energy and its immune boosting properties. Bio Nutrition uses the finest quality cracked cell wall Pine Pollen in a vegetarian capsule. By being cracked cell wall broken it help’s increase the digestibility while retaining the quality of the pollen. Espanol: Bio Nutrition utiliza el polen de pino agrietado de la pared celular de la mejor calidad en una capsula vegetariana. Al romperese la pared celular, ayuda a aumentar la digestibilidad sin perder la calidad del polen. Se ha utilizado durante siglos en la medicina china por su efecto de vitalidad y libido, energia natural y sus propiedades de refuerzo inmunitario. AMOUNT PER SERVING (3 VEGETARIAN CAPSULES): Pure Pine Pollen Powder 10:1 Extract 1,500 mg (Pinus massoniana)(cracked cell wall). ADDITIONAL INGREDIENTS: Vegetable Cellulose, Vegetable Stearate and Silica. Free of wheat, dairy, corn, soy and preservatives. Improve libido and stamina; boost natural energy; immune support. Take three (3) capsules daily or as directed by a healthcare professional. Do not exceed the daily dose. Warning: Not intended for use by pregnant or nursing women. If you are taking any medications or have any medical condition, consult your doctor before use. 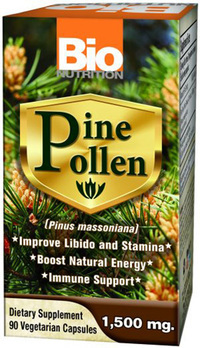 Avoid this product if you are allergic to pine or pine pollen products. If any adverse reactions occur, immediately stop using this product and consult your doctor. Not intended for use by persons under the age of 18. If seal is damaged, do not use. Keep out of reach of children. Store in a cool, dry place.